George W. Bush evokes strong reactions — from criticism based on strong emotions to senseless adulation. His critics call the US under him an “empire", which, of course, his supporters don’t agree with. 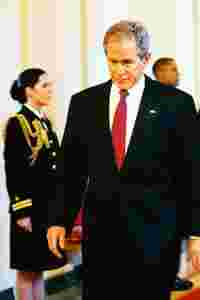 A realistic appraisal of American foreign policy under Bush is indeed a difficult task. 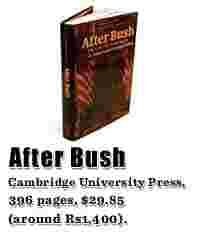 In After Bush: The Case for Continuity in American Foreign Policy, Timothy J. Lynch and Robert S. Singh walk the tightrope: How to say what they conclude is true about American foreign policy under Bush without letting their book degenerate into a hatchet job. Their book joins a growing list of revisionist works on the subject. So far, the consensus has been that in the 20th century, the US led a coalition of nations that emerged at the end of World War II. Decisions were arrived at by consensus and the will of the international community was expressed through multilateral bodies, such as the UN. Critics say Bush undid a large part of that. The invasion of Iraq in 2003 and an unending war on terror post 9/11 are cited as examples of blatant violation of that norm. Lynch and Singh believe that such arguments ignore American history; that Bush isn’t the first of his kind. The country has always oscillated between isolationism and expansive tendencies overseas, especially when national security is a concern. The first such instance can be dated to the age of John Quincy Adams, the secretary of state under James Monroe in 1817. It was Adams, not Bush, who pioneered the doctrine of pre-emption. Then, less than a century later, the sinking of the USS Maine in Havana harbour in 1898 led another president, Theodore Roosevelt, to invade Cuba. In the 20th century, successive presidents—from William Howard Taft to Woodrow Wilson to Ronald Reagan— intervened abroad in a unilateral fashion. It is obvious to anyone that opprobrium for this historical continuity has fallen more severely on George Bush. This, as the authors show, is a function of the age in which we live; Bush is not setting a unique precedent. It also shows how political fashions have taken over the conduct of international relations, an arena that does not brook sentimental homilies. Yet, that is what Europe is wont to. Never mind the bloodshed in Serbia, Bosnia, Kosovo and now Georgia. Then there is the case of West Asian Islamic nations. Lacking even the minimal liberty that citizens of democracies enjoy, they are laboratories for creating violent ideologies. What marked a difference between Bush and his predecessors was the presence of a group of officials in his administration who believed that the internal structure and nature of such regimes is a determinant of their external outlook. Hence, notions such as regime change, pre-emption etc., which gave birth to the “freedom agenda": Export democracy and everything will fall in place. This is likely to remain unaltered even after Bush departs from the White House. Both John McCain and Barack Obama agree on the importance of freedom in West Asia and its link to American security. The core of this book is an analysis of what has gone wrong in West Asia and what can be done to change that. This begins with two “audits" of the war on terror—negative and positive. There’s no gainsaying that the authors think the war is working. Their prescriptions, both for the region and countries, separately seem fine. But only now, not in retrospect. What is surprising is that for scholars who profess the importance of history, Lynch and Singh sidestep it in this case. They don’t look at American actions in West Asia and their consequences. Maintenance of “friendly authoritarian" regimes was seen as an essential part of halting communism. It was important for maintaining the energy security of the “free world". But for practitioners of foreign policy, it’s important to understand the nature of unintended consequences. By their nature, such consequences can’t be predicted, but an appreciation of their existence can limit the damage when the inevitable happens.